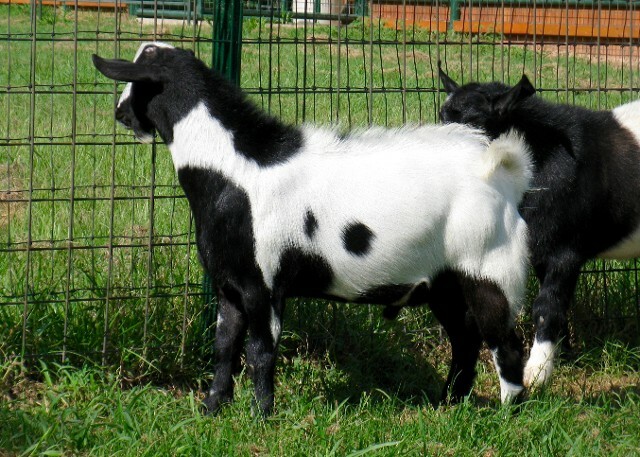 You’ll Love Raising Myotonic Goats! 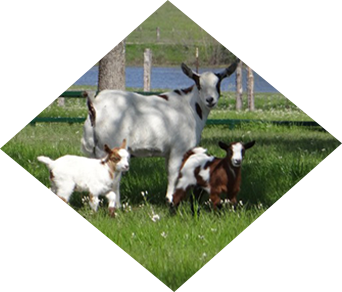 At J-I Ranch in Bedias, Texas, we offer pasture-fed, free range adult and young goats for sale. 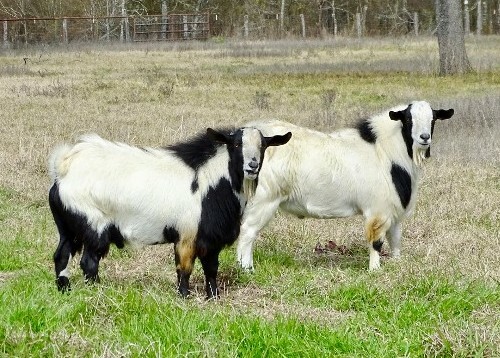 Does and bucks from our herd make great breeding-stock for improvements to existing herds, cross-breeding programs, or as foundation-goats for starting new herds. We also offer a range of high-quality Myotonic show bucks and does. Historically, every spring & fall, newborn kids arrive on the ranch. Our 2019 breeding program will introduce some new and exciting young bucks and does, as well as the return of the older fan favorites. The main breeding program will commence in May, with kids arriving in October-November. Our kids are weaned and available for pick-up at 8-12 weeks. Unless otherwise arranged, all kids will be dis-budded and CDT-vaccinated. We encourage you to select your kids early. 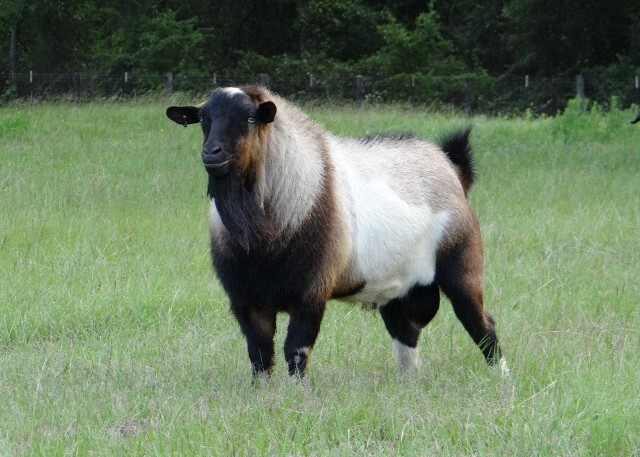 Our Myotonic herd does are a combination of Tennessee and Texas/ Tennessee bloodlines. 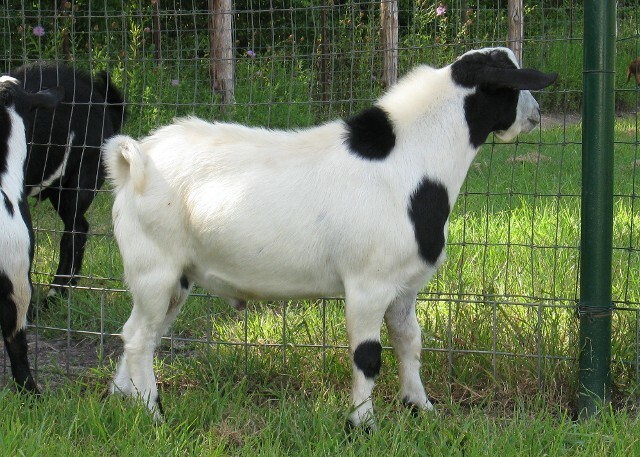 From the black & white Tennessee lines to the black & white, deep brown, white and fawn of the Texas / Tennessee bloodlines; there is a beautiful show of color & markings. 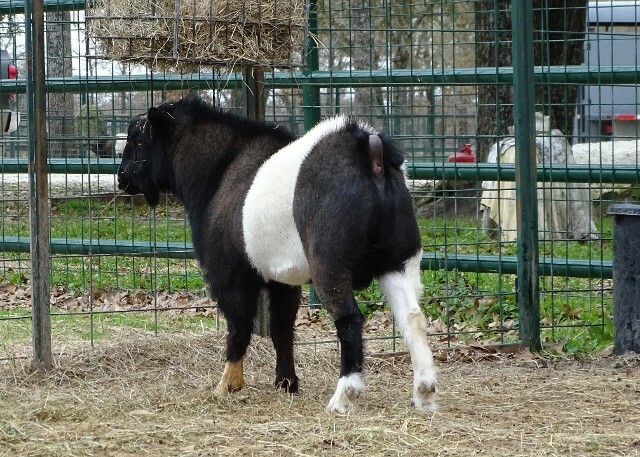 Many are bi- or tri-colored. 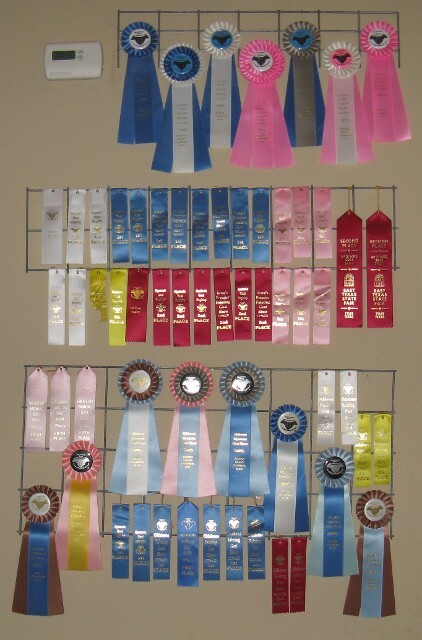 Doe pedigrees include a number of championship bloodlines - both Permanent Grand Champions and National Champions. Our Jr.does are beginning to establish their own championship titles. 'Wolf River Jane', born and raised at J-I Ranch, won Grand Champion Doe at the '2017 Iowa's Premier Myotonic Show' when 7 months old. We are looking forward to when she will be eligible to be shown again (> two years old). 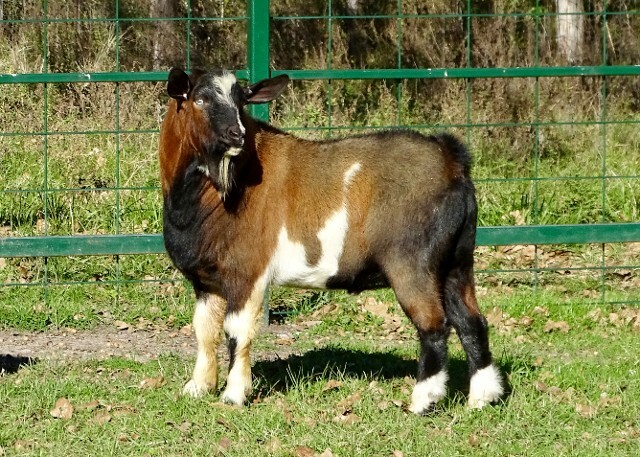 In 2017, a "Bakken's Farm Kid Rock" doeling, Georgia, was purchased. Georgia has won a number of Jr. Champion Doe and Reserve Grand Champion Doe titles from MGR shows in 2017-2018. Both does were bred in June 2018, with kids on the ground in November 2018. Another youngster to watch is newcomer J-I Polaris (Sire: Hillside Acres Bear). Born in 2018, she won Reserve Jr. Champion Doe at the MGR Louisiana Laginappe Buckle Blast in September against stiff competition. Our Myotonic herd sires come from a long-line of award-winning bucks. Zeus (aka Wolf River Dalton) is the son of 2014 National Champion ‘Wolf River Malachi’ and grandson of Permanent Grand Champion ‘Hillside Acres Dinger’. 'Hillside Acres' Cash is the son of Permanent Grand Champion ‘S-L Cee Money’ and great-grandson of Permanent Grand Champion ‘Jamcin’s Sassparilla’, Permanent Grand Champion ‘Redbud Eight Kris’ and Permanent Grand Champion ‘S-L Superman’. 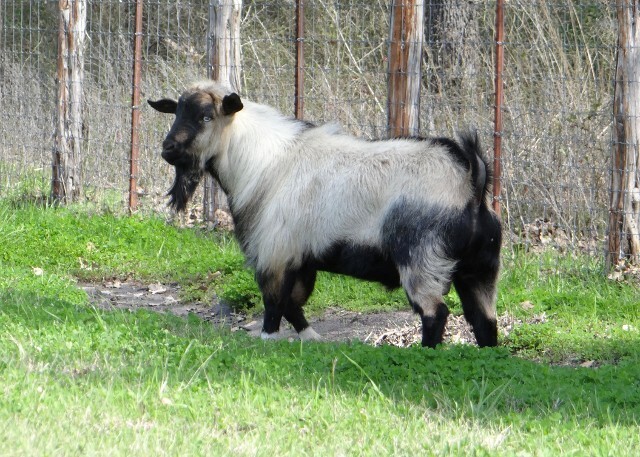 In 2017, three young bucks were introduced to provide bloodline diversity - 'Rising Sun Goat Farm Jaxson', 'Hillside Acres Bear', and 'Powerhouse Genetics Thunder'. Powerhouse Genetics Thunder is grandson of Permanent Grand Champion 'Bakken's Farm Kid Rock'. Jaxson is the son of Permanent Grand Champion 'Powerhouse Genetics Hugh' and Grand Champion 'Buck Creek Joline', and grandson of Permanent Grand Champion 'Buck Creek Hannah' and Permanent Grand Champion 'Buck Creek Romeo'. Jaxson won Grand Champion Buck and twice Jr Champion Buck at the '2017 MGR Midwest Myotonic Show' and Grand Champion Buck, twice Reserve Grand Champion Buck, twice Sr Champion Buck and once Reserve Sr Champion Buck at the '2018 Texas Myotonic Show Down'. He is not eligible to be shown again until he is two years old. Bear is the son of Permanent Grand Champion 'Bakken's Farm Kid Rock' and great-grandson of Permanent Grand Champion 'Jamsim's Sassparila' and great-grandson of 2010 National Champion 'Woody Creek Farm WLS Hotrod'. Born in January 2017, Bear established himself winning Reserve Grand Champion Buck, Jr Champion Buck, and twice Reserve Jr Champion Buck at the '2017 Iowa's Premier Myotonic Show'; Reserve Grand Champion Buck, Jr Champion Buck, and Reserve Jr Champion Buck at the '2017 MGR Midwest Myotonic Show'; Reserve Grand Champion Buck and Reserve Sr. Champion Buck at the '2018 Texas Myotonic Show Down', and three-times Reserve Grand Champion Buck, Sr. Champion Buck, and twice Reserve Sr. Champion Buck at the '2018 MGR Louisiana Lagniappe Buckle Blast'. Although sold in late 2018, Bear, Cash, and Thunder will leave their genetics at the J-I Ranch through several offspring kept as herd does and bucks. J-I Kodiak (Sire: Hillside Acres Bear), born in March 2018, is already making an impact; winning twice Reserve Jr. Champion Buck at the '2018 Texas Myotonic Show Down' when he was 8 weeks old and winning Grand Champion Buck at the '2018 MGR Louisiana Lagniappe Buckle Blast' when 6 months old. 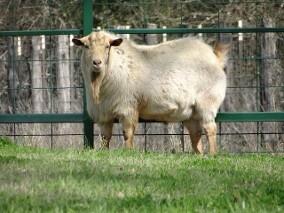 He is not eligible to be shown again until he is a senior buck (>1 year old). 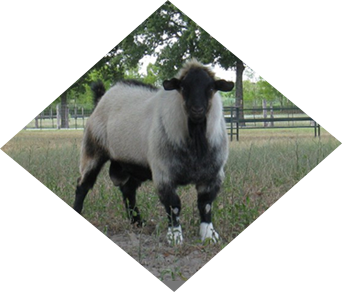 J-I Captain Nemo and J-I Salazar (Sire: Rising Sun Goat Farm Jaxson) have also been kept as future herd sires for use in the 2019 breeding program. J-I Salazar was named Jr. Champion Buck at the '2018 MGR Louisiana Lagniappe Buckle Blast'. Captain Nemo continues to show great promise. 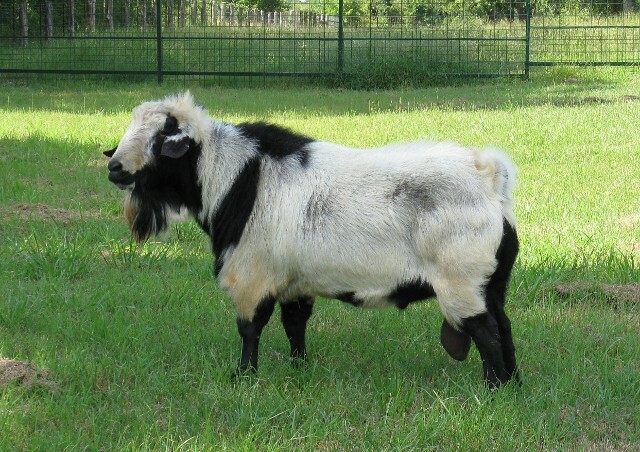 All herd sires are registered 100% Myotonic bucks. Rembrandt - DOB 2/15/2018. SOLD. Picasso - DOB 2/15/2018. SOLD. 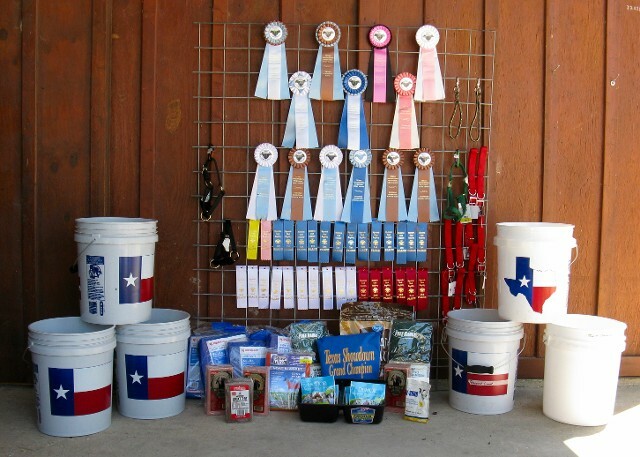 Why is show participation important as a breeder? 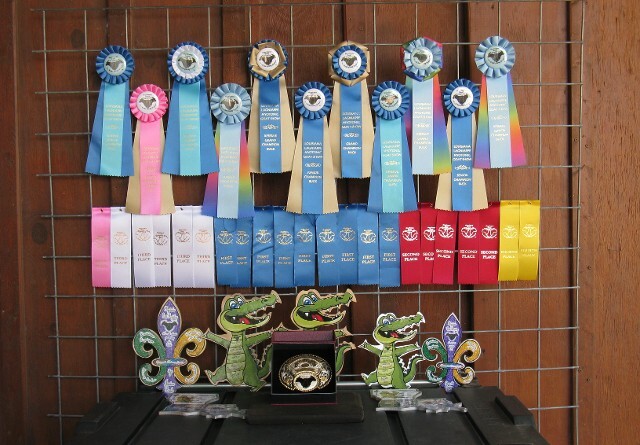 Although our primary focus is not as show exhibitors, it is important to us that our breeding stock upholds/excels at meeting breed standards and conformation. Therefore, 1-2 times per year, we select a handful of our breeding stock (does & bucks) and participate in MGR-sanctioned shows. This allows us to receive feedback from a number of qualified judges regarding the conformation and condition of our breeding stock. As breeders, we are serious about promoting good health and good conformation. 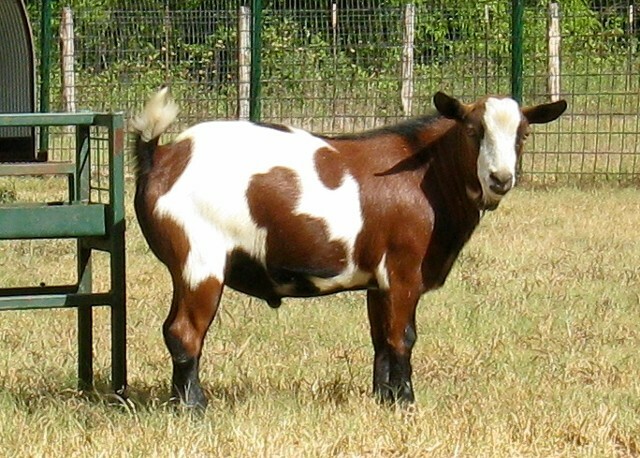 Conformation is necessary for the long-term productivity and sustainability of the individual goat and ultimately, the herd. In 2017, we participated two shows - the Iowa's Premier Myotonic Goat Show and the MGR Midwest Myotonic Goat Show. 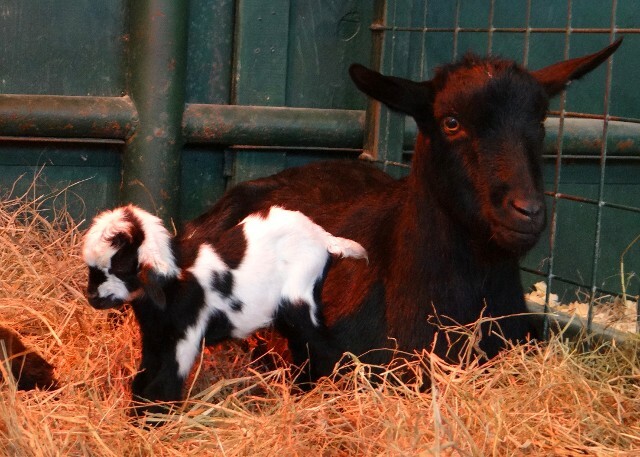 We took 11 goats to Iowa and 7 goats to Oklahoma. In 2018, we also participated in two shows. At the Texas Myotonic Show Down, in addition to showing breeding stock, we introduced some of our 'new arrivals' in the pee-wee classes. This was a first showing of the offspring from sires 'Bear' & 'Jaxson'. We also participated in the MGR Louisiana Lapinappe in the Fall, taking mostly junior bucks & does. 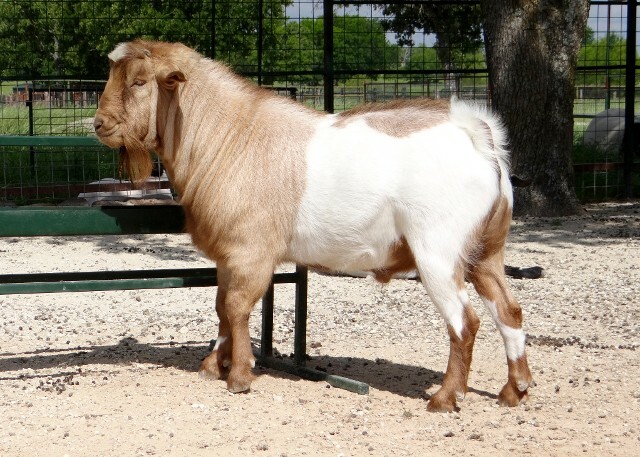 J-I Kimbo was named Grand Champion Buck at several shows in Louisiana in 2018. Hats off to David Risby, owner & exhibitor. J-I Ari, owned by Ronnie & Myra Gonzales and exhibited by their daughter, was named 3 times Jr Champion Wether, Reserve Grand Champion Wether, and twice Grand Champion Wether at the 2018 Texas Myotonic Show Down. J-I Boudreaux, owned by Janice Foster, was named Jr. Champion Buck at the 2018 Texas Myotonic Show Down show. J-I Rob Roy, owned by Weston Birdwell, was named Reserve Grand Champion Buck at a Fall 2018 4-H show in Louisiana. 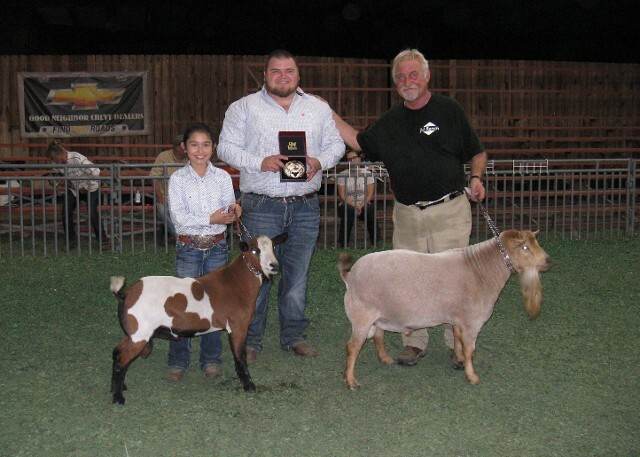 J-I Sedona, owned by Weston Birdwell, was named Grand Champion Doe & Division Grand Champion Doe at the 2019 Leesvile LA Jr. Louisiana Goat Association show. J-I Picasso, owned by Weston Birdwell, was named Reserve Division Champion Buck at the 2019 Leesvile LA Jr. Louisiana Goat Association show. Grand Champion Buck (J-I Kodiak) and Reserve Grand Champion Buck (Bear) - 2018 MGR Louisiana Laginappe Buckle Blast.